Testoged-C is a strong anabolic steroid and androgen. It is remarkable first and foremost a sufficiently powerful and at the same time long positive impact on the human body. The active substance Testoged-C is a popular and effective testosterone ester - testosterone cypionate. This steroid has become widespread in sports practice, and in medical circles. In sports (bodybuilding, power disciplines, weightlifting, etc. ), it is used to quickly gain muscle mass and increase strength, and in medicine - to strengthen and improve the functioning of the body (elimination of joint pain, significant increase in appetite, strengthening of bone structure, etc.). For the first time testosterone cypionate appeared in the western market of pharmacology in the mid-20th century, in the 50s. At that time Pharmacia & Upjohn, a pharmacological company, was engaged in its release. At first, the steroid, perceived as an alternative to the enanthate ether, did not receive proper propagation. However, over time, interest in him and his properties grew, as a result of which nowadays it is used by athletes around the world. If we talk about the positive qualities that testosterone cypionate boasts, and specifically Testoged-C 200, then first of all it should be noted that its effect lasts from 15 to 16 days, which is very, very much. This, by the way, relieves the athlete from the need for frequent injections (in most cases, cypionate is taken once a week). •Strengthening of bones and overall bone structure. However, it is worthwhile to understand that this drug can not only have a positive effect. Thus, during the reception of Testoged-C, these or other side effects may occur. In particular, androgenic "pobochki", such as acne, acne, greasy skin, loss of hair on the head according to the male type, the hair of the body and face, can give information about themselves. If you want fast results in bodybuilding, buy Testoged-C online in our store and start creating your body right now. Most often, this drug is used by athletes to speedily dial muscle and increase strength. And during the course it is used both in solo and in combinations. With what steroids and how to take Testoged-C? There are many possible combinations, so we mention only some that are popular. For example, the use of Testoged-C and turinabol is very common in sports practice (the first is administered in the volume of about 400 mg per week, the second - 40-50 mg per day). This course lasts an average of 8 weeks, during this time you can achieve not only a qualitative increase in muscle mass and strength, but also increase speed, endurance, appetite and other indicators. As for PBC, here athletes usually use Clenbuterol, Tamoxifen and Winstrol to minimize possible side effects and consolidate the results. Also, the Testoged-C course is often combined with the use of methandienone and stanozolol. Dosages are as follows: testosterone cypionate - about 500 mg per week, methandienone - 30-40 mg per day, stanozolol - about 30 mg per day. To minimize and eliminate possible side effects, Tamoxifen, Proviron and Clenbuterol are useful. Beware of fakes. 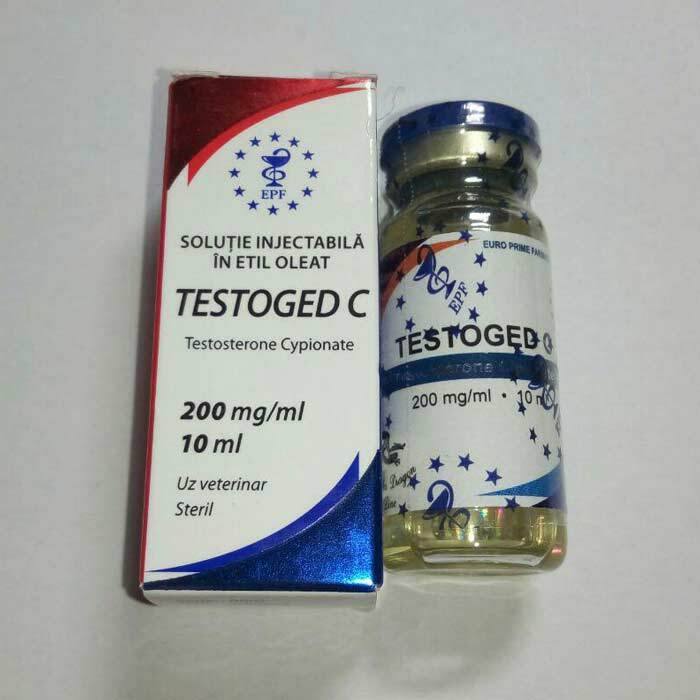 In our store you can buy Testoged-C online in original quality at an affordable price.